I was really unsure what I was going to make.. I had this vision. I love how it turned out! and link up your entry! file also comes with balloons that I did not use. I hope you enjoy my project! looking at the beauty of these creations. at her blog to find out how to enter the drawing. from the Silhouette Online Store, by Hero Arts. hope you enjoyed fluttering through! Head on over to Jamie's blog to finish the hop! 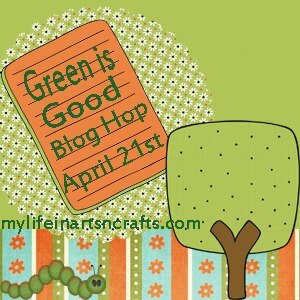 Green is good Blog Hop! you did. There are tons of ways to get greener in everyday life. Today we are showing off our creations to celebrate Earth Day 2013.
at My Life in Arts’ n Crafts’. I hear she’s giving away some goodies! to see what she made! 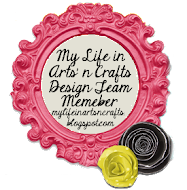 Welcome to the Scraps to Treasure’s Blog Hop. ideas on what to do with those crazy scraps that keep piling up! Our goal is to inspire you to go through your stash and create! our Scraps to Treasure Team too! blog to where the hop started so you don't miss a thing! I chose to make to inspire you! For this card I used several cutting files. is from the Paper Smooches Whimsical set. attached, I cut it out after stamping it. right to your inbox or follow via BlogLovin! you think of my fancy fold card! to get some fun stuff for your next project! Time again for another Creative Cutting Challenge! we would love to see what you made too! to link up your entry! 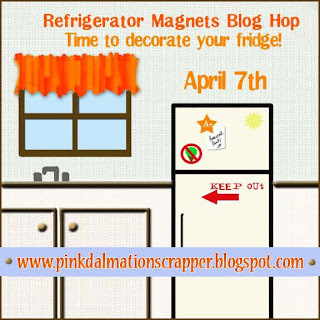 If you have just stumbled upon the hop, Lissa Marie is your host at So Many Crafts, So Little Time today, so if you came from her blog you are in the right spot. Please grab your cup of coffee or favorite drink, relax as you browse through the awesome mini’s we have made for you, then get ready to win some blog candy! She would love to reward one special blog visitor with a 5 free patterns! comment on all participating blogs. have done your part to be entered into the drawing. 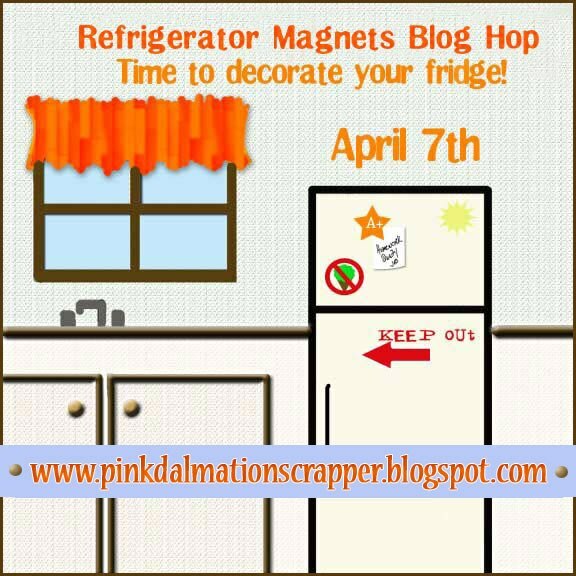 Don’t forget to keep an eye out for more blog candy offered throughout the hop. Some blogs are offering extra perks on their own! 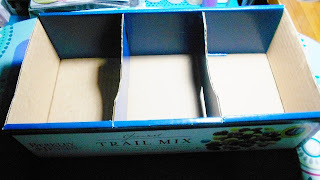 If they are offering even more blog candy they all have their own wishes for you to win, so don't forget to read the rules for each one as every blog has different requirements. my daughter can store little memories like movie tickets.. Thank you for taking the time out to check out my project, if you like my project and you are not already a follower, you are encouraged to add your email in the subscribe area to get updates right in our inbox, or follow me using BlogLovin! Keep clicking for more Mini Album Ideas! Thank you for hopping through our Mini Album Hop! what we all do in some form weather it is our photos or projects..
magnets! Spring clean means spring decor to me! Magnets can be done so many different ways… the sky is the limit! from www.somanycrafts.com, you are in the right place! 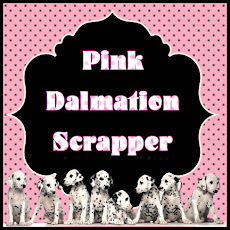 scrapper.blogspot.com so you don't miss a thing! and because I have so much scrap paper.. I used my scraps. The magnets and buttons I got from Miriam's Crafting Supplies. hold up better with regular use. Thanks so much for hopping with us! Here is your line up in case you need it to navigate…..
month to to see what the Krazy Crafting Crew is up to! We'd love you to link up and join our challenge! Please make sure your blog posts has a link back to us. Thanks for participating in this weeks challenge. Winners will be announced on April 15, 2013. Go Here to enter your creations. Thank you so much for stopping by my blog today! This time we made baby items! 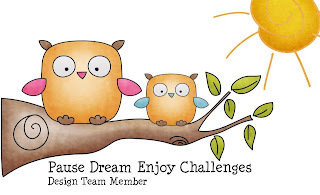 Challenges blog and enter your baby project! I was so excited I made her this thank you card! 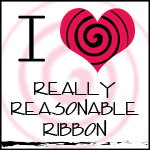 to offer, especially if you love my card!